Regardless of coupling technology and wrench sizes KENNFIXX ® unites highest demands in practical and qualitative sense in only one single component. 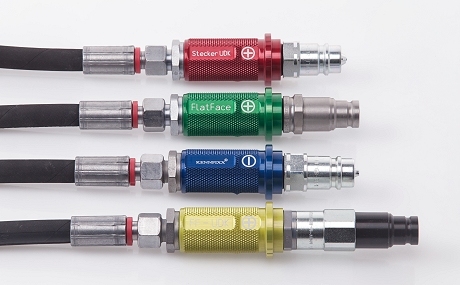 Pressure-resistant, knurled and anodized aluminium is individualized PERMANENTLY LEGIBLE with laser labelling. This leaves behind a lasting quality impression with regard to visual appearance and haptics. 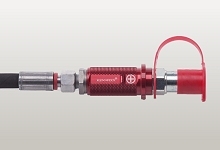 KENNFIXX ® heightens safety and comfort when hydraulic lines are coupled. Expensive and time-wasting machine downtimes and mix-ups belong to the past now. KENNFIXX ® product family has been growing consequently during the past few months and meets the requirements of modern agricultural engineering. 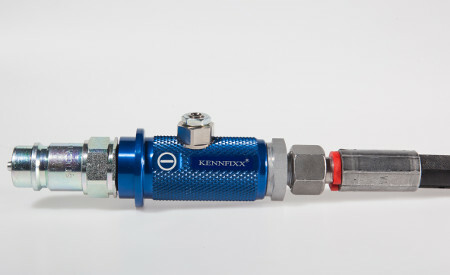 A huge number of OEMs as well as operators in daily practice already work with the KENNFIXX ® system. We would like to present to you the product family and its possibilities. Get inspired by this innovative label grip and give a lasting impression of quality to your machines and convince your customers. 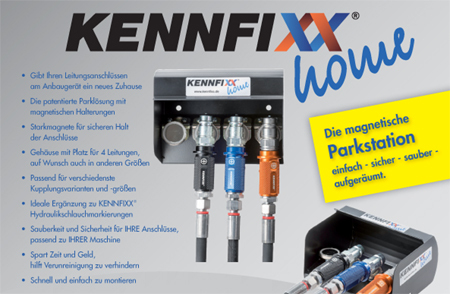 KENNFIXX ® home is the patented docking station with magnetic fixtures for different couplings. Besides the standard size (BG) 3 for the most agricultural applications with ISO-A couplings DN 12,5 BG 4 is available for the high-volume return flow as well as the size BG 2 for LS-lines (load sensing lines). The series BG 3 is equipped with a coupling extension in front of the stop ring. Thus, a safe and comfortable coupling into the plastic socket box at the rear of the tractor is always granted. KENNFIXX ® is a very flexible system, independent from coupling technology and wrench sizes of the hydraulic couplings in use. KENNFIXX ® can be combined with flat sealing hydraulic couplings, plug couplings and thread couplings with cone valve as well as couplings which can be coupled under pressure. The KENNFIXX ® system can be dismounted without any problems in case of changes in the machinery; so it can be assembled to the new machine. 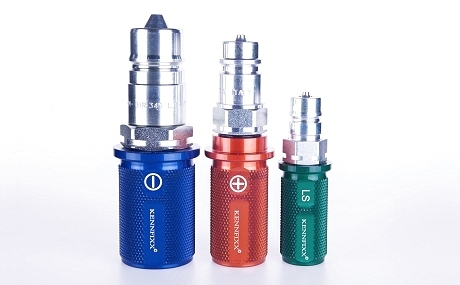 A hexagon socket allows the assembly without any damage of the anodized surface. We have continued the development of KENNFIXX ® for the purpose of offering a solution for comfortable handling of high pressure air-lines. KENNFIXX ® air is an adjustable and anti-skidding support for coupling that contributes to a permanent protection of your air-lines. The KENNFIXX ® air grip is fixed in its position by means of an adjustable screw nut. 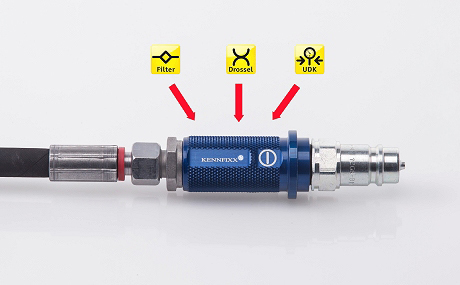 The connector is angled by 45° and allows laying of the lines according to your requirements. Thus an optimum positioning of the high pressure air-line is ensured, taking ergonomics as well as material protection into consideration. Buckling is avoided and thus the line is protected. The grips are available in Red and Yellow. 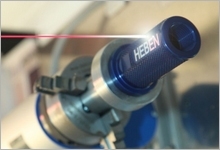 KENNFIXX ® air naturally provides the other wellknown advantages of the KENNFIXX ® hydraulic hose grip, e. g. fluted surface, possibility of lasering, anodized aluminium and anti-skidding haptics. KENNFIXX ® hydraulic hose handle with throttle function allows safe and simple regulation of the oil quantity in the hydraulic line. The throttle function supports users in agriculture for example with the pick-up function at the press or at the loader wagon as well as with the folding out of a cantilever. Here, it might be necessary to regulate the flow rate of the hydraulic oil – e. g. when lifting or lowering. Once set, the setting remains even when the attachment is used with other tractors of the vehicle fleet. According to the application and purpose it is possible to adjust the flow rate in an easy and safe way – directly at the hose of the attachment. On demand filter screens or choke units for flow control can be mounted into the KENNFIXX ® grips of the size BG 3. Thus, KENNFIXX ® meets further essential requirements additionally to the marking and grip function. Amongst others KENNFIXX ® perfectly meets the requirements of agricultural engineering. 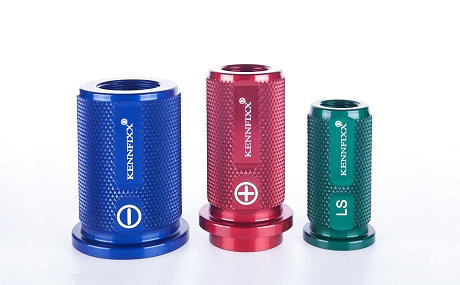 KENNFIXX ® laser engraving offers a huge variety of individual labelling of your KENNFIXX ® – hose grips. Thanks to hightech laser engraving we achieve best results in original equipment manufacturer quality (OEM-quality). Factory-made there is always the symbol „+“ or „-“ lasered on three sides. On two sides there is space for your individual texts. Company logos, function information, symbols or even QR-codes referring to webpages or instructions can be engraved. Decide for permanent high-quality legibility ex fabrication. 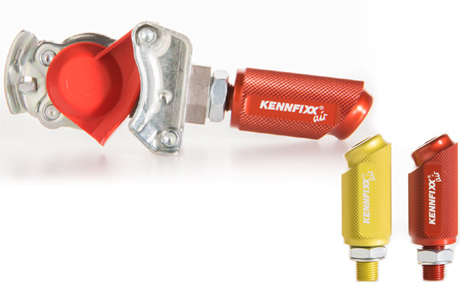 On demand the KENNFIXX ® hose grips are also available with premounted coupling kits with assembled hose. On request the hydraulic hoses are cleaned and they are available with a test certificate together with KENNFIXX ® in a kit. We produce and assemble according to your demands in OEM-quality. 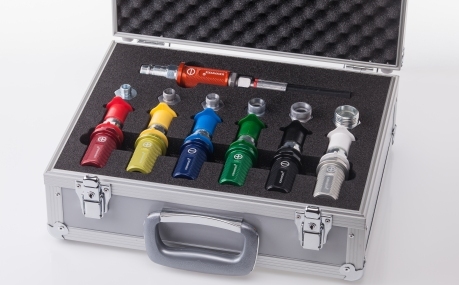 Suitable dust caps are available for all 10 colours of KENNFIXX ®. 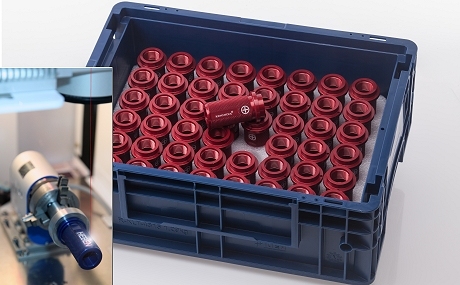 The KENNFIXX ® sample case for trade and distribution is the perfect presentation possibility to introduce the KENNFIXX ® system to your customers in a clear and comprehensive way. 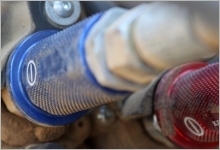 The KENNFIXX ® colour ring is the perfect addition to the KENNFIXX ® hose grip for the coloured marking of the side of the socket if there is no box for the socket at the rear of the tractor. The KENNFIXX ® colour ring is also suitable for many applications in the municipal and construction machines sectors. 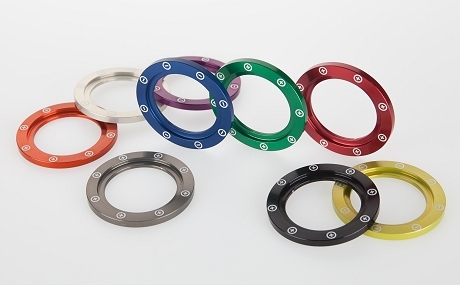 The KENNFIXX ® colour ring is also made of anodized aluminium and delivered with circumferential “+” or “-” engraving or with a lasering on demand.